Ifield collected maximum points in a tight 17-run victory over St James with Guru Kedarnath and Daniel Groves among the runs and wickets. St James won the toss and opted to bowl first on a wicket that was always going to offer some assistance after the recent wet weather and they struck early when Joe Smith was caught for just 3. Ifield found themselves in a spot of bother at 38 for 3. Captain Jack Groves and Guru Kedarnath got the innings back on track with a 67-run partnership during which Kedarnath reached his second consecutive 50 but he was out caught for 62 at 105 for 4. Groves was dismissed for 31 and then the wickets of Vish Patel and Zac Siddiqui quickly followed and suddenly the game had swung again and Ifield were back in trouble at 120 for 7. Daniel Groves despatched spinner Adam Cooper for 25 in 3 overs including 2 huge 6’s into the road. ifield’s innings finished on 164 after 46 overs with Groves left stranded on 33 not out. Pratik Patel and Daniel Groves opened the bowling and with his very first ball Groves removed Taylor’s leg stump and then struck again when he had Sim’s caught by Vohra in the covers for 10. 33 for 2 became 47 for 3 when Kedarnath had Richards caught by Joe Smith for just 9 and then there were 2 further quick wickets with the score on 53. The key wicket of Loughton came when Michael Murray was trapped LBW by Kedarnath for 32 to give the Ifield overseas player his fourth wicket of the innings but with only 35 runs needed and 2 wickets in hand it was still anyone’s game. 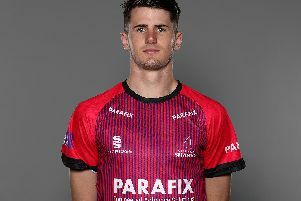 Daniel Groves was called back into the attack to replace Parekh and he bowled Blake for 4 to bring last man Adam Cooper to the wicket to join Murray with 31 still needed. Murray kept the strike but the crucial point came when he hit Groves for a boundary off the first ball of the 45th over but was then pinned down with 5 dot balls meaning that Kedarnath was able to bowl to Cooper next over. The first ball was edged and keeper Groves took the catch to take victory and secure the vital 30 points. Murray ended 23 not out. Kedarnath finished with 5 for 33 to go with his 62 runs and Groves 3 for 36 to go with his 33 not out. Parekh picked up the other 2 wickets. This Saturday Ifield are at home to relegation rivals Findon.